The first Caesar Salad was made by an Italian immigrant, Caesar Cardini, in Tijuana Mexico in 1924. The young Italian entrepreneur had arrived from Italy to Mexico with his 3 brothers where he opened a restaurant (to avoid the restrictions of prohibition) while also opening another restaurant in Sacramento California. His daughter Rosa later told how her father invented the dish on the 4th of July having run low on stock. Cardini rolled his service cart into the centre of the restaurant and created the Caesar salad with the only ingredients he had to hand: Romaine lettuce, lemons, eggs, garlic oil, croutons and parmesan cheese. With the added dramatic flair of the table-side salad toss by the chef, a legend was born. Some members of Cardini’s staff have said that they themselves invented the dish, but it cannot be denied that it was Cardini that popularised it. The salad became the fad of Hollywood celebrities especially when he opened Caesar’s Hotel there. So much so, that Cardini and his family moved to Los Angeles in 1935 where he focused on producing and marketing his salad dressing. He trademarked it in 1948. When he died of a stroke in 1956 his salad was a household name but when his daughter took control, the ‘Cardini’s Original Caesar Dressing’ grew to be a staple in American homes. It’s pretty good out of the bottle but as is (almost) always the case, it’s better to make you own version of the dressing and the Caesar Salad. When making dressings, even if I end up using another recipe, I always refer to Darina Allen’s Ballymaloe Cookery Course book for technique and reassurance. It’s the grandmother of books. If you like to cook and if you don’t have this book, I suggest you get it. You will not find another cookery instruction book more concise and comprehensive. It taught me how to cook exactly and how to cook with instinct also. As a scientist, I love it because nothing is missing and everything is in the right order. Fool-proof! I include here Darina’s Caesar salad dressing recipe. 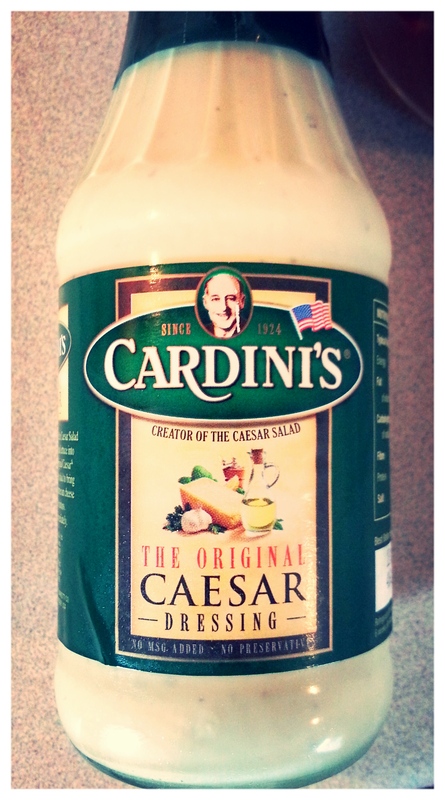 For the actual Caesar Salad, like Cardini, use what you have. We often make it as described below, but adding leftover Sunday roast chicken. But remember to keep the crunch of the Cos (Romaine) with the lettuce that you use, and the saltiness of the parmesan. Wash and dry the lettuce leaves. Drain the anchovies and crush lightly with a fork. Put into a bowl with the egg yolks, garlic, lemon juice, mustard powder, salt, Worcestershire and Tabasco sauces and whisk. As you whisk, add the oils slowly until the emulsion forms and then you can add a little faster. Whisk in water to make a thinner consistency. Taste the dressing and season to taste. To make croutons: heat olive oil and butter in a frying pan over a medium heat. Add the cubes of bread and fry till golden brown on all sides. Spread on kitchen paper to drain. If you are watching the calories, you could just toast the bread and cube accordingly but you will get a guilt-free lack of real crunch. To serve: put 1 tablespoon of dressing per person into a large bowl. Add the lettuce, about half the croutons and half the parmesan. Toss gently with your hands. Add more dressing if necessary to coat the leaves fully. Serve with a sprinkle of the remaining croutons and parmesan.